The Long Valley Nature Trail begins near the bottom of the concrete sidewalk from the upper Tram Station. It is an easy walk of just 0.6 miles, with only 80 feet of elevation gain and loss. The trail has nine informative signs telling a bit about the natural history of this area. No permit is required. This trail has been covered just twice for this guide, on 16 August 2007 in a drought year and on 3 August 2012. More species would probably be seen in a normal rainfall year, as well as more specimens of some species found in the guide. This trail, and the connecting Desert View Trail, are the only trails, out of the 114 for which we have produced plant trail guides across southern California, that contain a leach field from a septic tank. This leach field produces the densest stand of wild tarragon, Artemisia dracunculus, that we have ever seen. 0.00 l Begin guide by going left at sign "Trail Information" near bottom of concrete sidewalk from Tram; elevation ~8395 feet (2559 m). 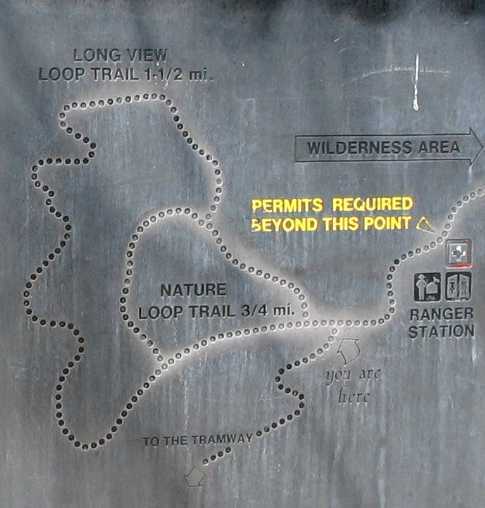 Sign shows a (not very accurate) map of this Nature Loop Trail and Long View Loop (aka Desert View) Trail. 0.02 l Sign: "Desert View Trail [ahead]"
0.03 l Sign: "Welcome to Long Valley", which now calls this trail the "Long Valley Discovery Trail"! 0.07 l Long Valley Meadow; sign: "Fragile Area; stay on trail"
0.08 l Sign: "How special is Long Valley?" 0.18 l Sign: "Birds on the wing"
0.23 l Sign: " 'Cool' plants and birds"
0.30 l Sign: "Dependent on moisture"
0.35 l Sign: "A different habitat"
0.39 r Sign: "The fight for survival"
0.46 r Sign: "Meet Jeff"
0.53 l Sign: "The fragile meadow"
0.54 End Nature Trail Loop. Continue ahead to the Tram sidewalk, or go back to do the Desert View Trail.